A group of Southern elder statesmen, on Tuesday, stated that no region will gain meaningfully from disintegration of Nigeria. The elders, led by the country’s former High Commissioner to the United Kingdom, Dr. Christopher Kolade and former Chief Executive Officer of Nigeria Economic Summit Group (NESG), Prof. Anya o. Anya, spoke in Lagos. They met under the aegis of YIIEGBA, an inter-ethnic coalition established to ensure unity, progress and good governance in the country. “We believe that staying together and working together is the only viable way to go. “There is no alternative to one Nigeria. As elders, we shall do everything necessary to keep the nation as one. 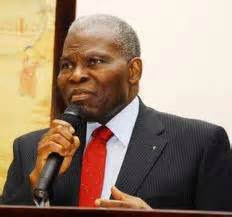 “We are facing current challenges with the wisdom of the past for a better future”, ‎Kolade said. Kolade warned that those who witnessed the civil war must not keep silent now that some groups seemed to be clamouring for violence against the state. He appealed against hate speeches and other acts capable of disintegrating the nation, saying the price for peace are always cheaper than that of war. Anya, who is co-chairman of the coalition, advocated that the nation must restructure to avoid the looming conflagrations. He assured that the coalition will continue to push for a new Nigeria “with equity, fairness and progress”. Afenifere leader, Pa Ayo Adebanjo, in his remarks, advised those beating the war to calm, saying non-violence approach remains the most viable way to resolve nagging problems in the country. Others in attendance at the meeting were Chief Chukwuemeka Ezeife; Senator Ebenzer Ikenyina; Gen. Ike Nwachukwu (retd); Navy Capt. Alison Maduekwe (retd); Sen. Oladipo Olaitan and Amb. Uche Okeke. Others are Elder Nathaniel Okoro, Capt. Prekeme Porbeni (retd); Shyggle Wigwe and Yinka Odumakin, among others.